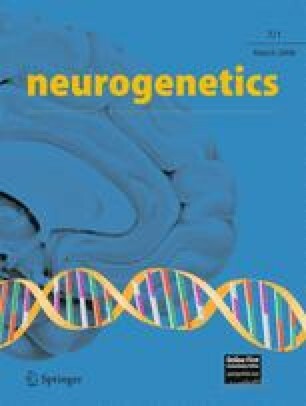 An expanded polyglutamine stretch in the huntingtin protein has been identified as the pathogenetic cause of Huntington's disease (HD). Although the length of the expanded polyglutamine repeat is inversely correlated with the age-at-onset, additional genetic factors are thought to modify the variance in the disease onset. As linkage analysis suggested a modifier locus on chromosome 4p, we investigated the functional relevance of S18Y polymorphism of the ubiquitin carboxy-terminal hydrolase L1 in 946 Caucasian HD patients. In this group, the allelic variation on locus S18Y is responsible for 1.1% of the variance in the HD age-at-onset, and the rare Y allele is associated with younger-aged cases. This study was supported by the GeNeMove Network for hereditary movement disorders financed by BMBF. The Polish part of the study performed in the Department of Genetics, Institute of Psychiatry and Neurology was supported by the State Committee for Scientific Research PBZ-KBN-042/P05/2001. A. Nazli Basak's research is sponsered by Bogazici University Research Funds and by Suna-Inan Kirac Foundation. Special thanks to K. Dietz, Department of Medical Biometry, University of Tübingen, Germany for statistical advice. Experiments comply with the current laws in Germany.